– Connection systems for equipment referred to above that are not held or worn by a person, but are designed to connect that equipment to an external device or to a reliable anchorage point and that are not designed to be permanently fixed or require fastening works before use. – PPE intended for private use against: atmospheric conditions or damp and water during dishwashing. 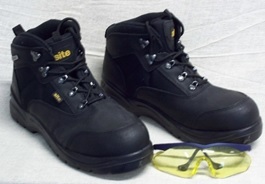 – PPE intended for exclusive use on seagoing vessels or aircraft that are subject to the relevant international treaties. – Head, face or eye protection intended for drivers and passengers of motorcycles and mopeds intended to be used on public roads. The previous PPE Directive (89/686/EEC) was replaced by a new EU Regulation 2016/425 on the 21st April 2018. The new Regulation can be viewed here on the European Commission’s website. The route to conformity for each category is shown in the following flow chart. 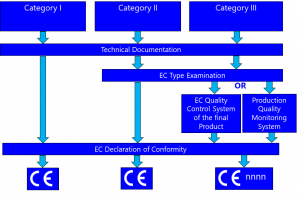 When the process has been completed the ‘CE’ can then be affixed. The CE Marking Association can assist manufacturers, distributors and importers of PPE by providing advice and guidance on the relevant Directives and standards. If you need support with affixing the CE mark, please can the technical team on 01564 792349.